It’s been a while, in fact, it’s been more than a year since I shared a homemade body wash recipe. But, you know what? Body wash is one of the few skin care products you can change frequently with ease and without regret! My Chamomile Lavender Body Wash, for example, is so easy to make you could finish it quicker than it will take you to read this article. Body wash is something you can change just to use your new scent combination obsession. And it’s totally worth it in just a few minutes you’ll have enough to last a few months. Then you’ll be asking yourself why you did make it sooner. 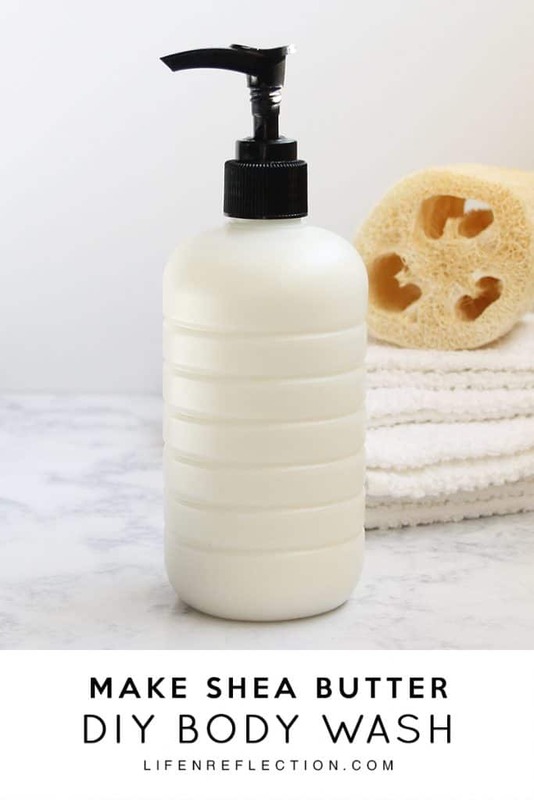 What makes this homemade body wash creamy and smooth? A unique combination of nourishing natural ingredients for the skin. Find my 20 Essential Ingredients For DIY Natural Skincare recipes here. Soap doesn’t need to be just soap. We can load it up with skin loving ingredients and our favorite scents. Also known as refined shea butter and unrefined shea butter. It has a light nutty scent and melts on contact with the skin. High in vitamins E, A, and F shea butter is an intense moisturizer known for healing dry scalps, cracked heels, and eczema. Popular for its anti-aging benefits, apricot kernel oil is an extreme moisturizer. It absorbs quickly into the skin while providing deep moisturizing benefits. Castile soap is a concentrated vegetable-based soap made of ingredients you can actually pronounce. This soap is gentle on skin and effective against dirt, grease, and unwanted germs. Castile soap can be used to clean just about anything and everything: your face, your shower, and even your dirty dishes! I use it in my aloe vera face wash, liquid laundry soap, heavy duty kitchen cleaner, and more! A powerhouse for natural skin care products, aloe vera gel is antibacterial, antiviral, antifungal, antioxidant, anti-inflammatory and an astringent. Known to support the healing of sunburns, cuts, and wounds quickly. Find it in my recipe for an Aloe Vera Face Cream that quenches the thirst of my skin and improves the oil production. An excellent humectant vegetable glycerin attracts water and helps to maintain moisture in the skin. And it feels incredibly smooth on the skin! Essential oils not only provide a wonderful natural fragrance to homemade skin care products and cleaners but also contain powerful cleaning properties. Learn more about why I use essentials oils every day here. Using the double boil method, melt shea butter on low heat or in the microwave at 30-second intervals. Remove mixture from heat once melted and set aside. In a medium bowl combine apricot oil, aloe vera gel, and vegetable glycerin. Stir well and pour in melted shea butter. Continue mixing and each drop of essential oil. To reduce bubbles pour mixture into a bottle using a funnel. Next, pour liquid castile soap into the bottle as well and then remove the funnel. Place the pump dispenser on the bottle and swirl to blend together. This creamy homemade body wash lathers up quite nicely and the scent combination smells like clean summer rain. As you wash you can feel the combination of shea butter, apricot oil, and vegetable glycerin adding a protective layer to your skin as the water beads up. After washing lock in moisture with one my favorites Moisturizing Pumpkin Lavender Body Butter and exfoliate once or twice a week with one of Summer’s Best DIY Body Scrubs! Hi, I love this post. I want to know what preservatives are to be used for increasing the shelf life? Prasanna, I recommend making skin care products in small amounts. You could add a teaspoon of raw honey to the body wash help extend the life. It great for the skin too! Kristy, where did you get the bottle pictured in this recipe? Love all your diy receipts!! Debbie, I actually washed and reused a bottle. I got in a free cleaning kit from the Grove Collaborative. It had Mrs. Meyers natural hand soap it. You can get one too with this link – https://www.lifenreflection.com/grove I am about re-purposing when I can! Thank you Kristy, I too reuse when possible, sometimes I have to go to Goo Gone to get stickers off of bottles and jars lol!!! Right! 😉 I use just a dab of lemon essential oil and a cloth or small bristle brush to remove stickers from jars and bottles. A friend of mine told me how to she used it remove stickers from the new windows she had put in. Then she said the funny thing was she later noticed the windows were cleaner where she had removed the stickers. So then she added the lemon eo to a one to one mixture of distilled water and vinegar to clean the windows! Hi again Kristy..hope all is well with you. Spearmint ..could you help me out by telling me what other essential oils I can use for this recipe in place of the ones you use??? Hi Debbie, do you have lavender essential oil? I love to pair lavender with spearmint! And lavender is very calming to the skin, which alone makes a great essential oil for body wash. This recipe sounds so great! I’m excited to try it out! I’ve never used apricot oil — is there a similar substitute for that? Those oils sounds like such an amazing blend too! Great post — thank you so much for sharing! Amanda, apricot oil is a great carrier oil for the skin. You can substitute for another carrier oil for skin such as sweet almond oil or FC coconut oil. I have an aloe vera plant and wanted to know if I could use the juice instead of the gel and how or if it would effect the composition of the body wash? Thank you so much for all of the amazing info! Thanks Amanda, you can certainly use that, I grow aloe vera too! The consistency will just be a little thinner. But this recipe is really creamy so thinner is A.O.K.